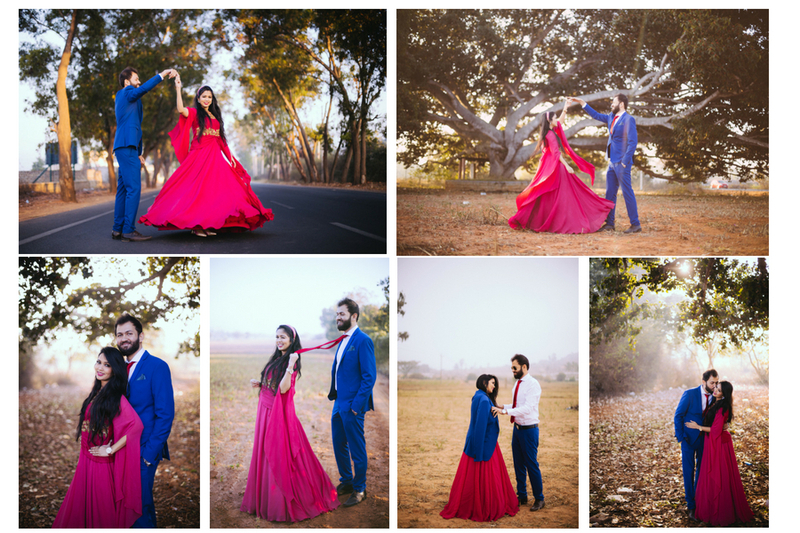 Once we were engaged, I (Anu) was too excited about Pre-wedding, not only excited but had lot of ideas of what I wanted. On the other hand, Mehul was the one who didn’t like to get clicked much and he found it cliché. But after all discussions and mind boggling sessions I was able to convince him that Pre-wedding was just a way to know each other better. At least in Long Distance Arranged marriage, it is really important as you get a reason to spend time together, open up and have fun! 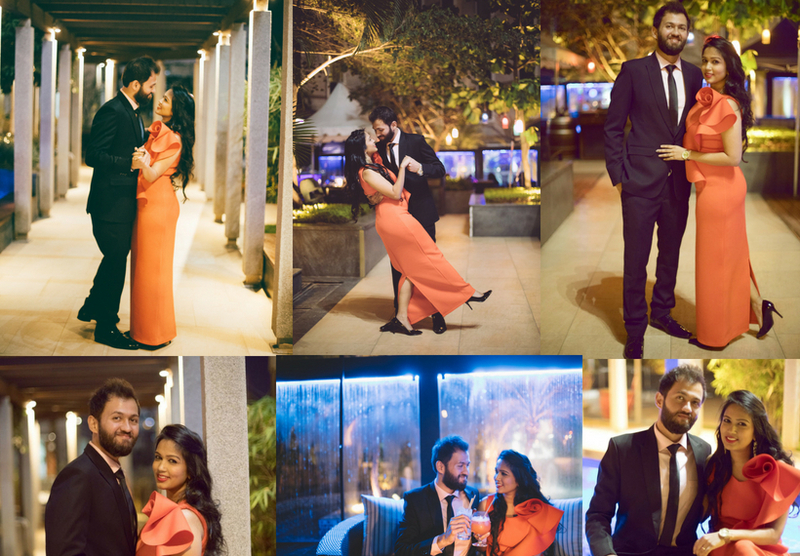 And trust me we had 3-day shoot and because the shoot was in Bangalore, I flew from Guwahati and stayed in Bangalore for 7 days and that 7 days was the best period of our courtship and it helped us get comfortable with each other and understand each other better. We were okay with spending on our shoot but we didn’t want a 2-3 hour shoot or just one day shoot. We wanted to enjoy it, not get tired of it! And we wanted it to be in different locations and outfits. We were not looking for a big team of photographers who would be too professional, but someone who could be amicable and would understand us. So, After speaking with lots of photographers who were either demanding excessively high for an hour or two or had a constraint on the number of outfits or were not available for our dates (so book them early). We, finally found our photographer Tanjil Tamuli, we had a long discussion over coffee about our locations, props, timings etc., not only he agreed to do it in 3 different days but was okay with any number of outfits and suggested us few! I have seen people doing their Pre-wedding shoot without much preparation. You are investing your time and money on it and you are going to treasure the pictures forever or get them framed on your wall (I have 😉 ) so obviously, you want them to be Awesome!! Search the internet for the latest trends if you have no idea about the shoot. Follow the top-wedding apps or Instagram pages. Decide the outfit and budget of the outfit (so you don’t go overboard). For the matter of fact, I didn’t want to invest much in my outfits. As I wasn’t sure if they will be re-usable for me. To find out if I ever used them… Keep reading!! Appoint a makeup artist if you want that or ask your photographer if they can arrange for the same. Make a list of which outfit to wear when as per the location, and what all accessories and props to carry along with that. I always save all my lists in my Notes. 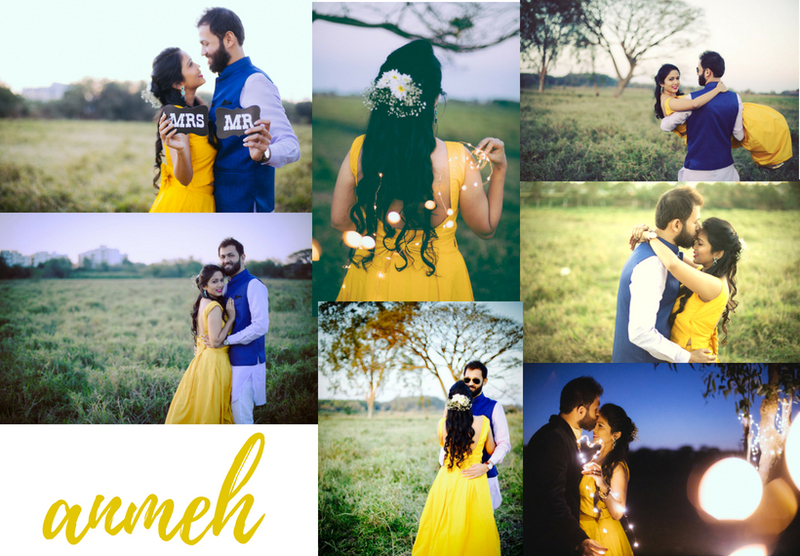 Our first-day shoot was planned to be done at Lalbagh, but cause we were super late and Lalbagh got crowded, we dropped that idea and our photographer took us to a quite nice location in Kormangla where we got the nature background we were looking for. I wanted to shoot in Indian dress but not a heavy one as that anyways we would have to get it on wedding functions, so I decided to go with a crop top with a bow at the back and skirt and the raw silk material gave the Indian touch. Mehul chose to wear a kurta with a Nehru jacket. Next use– Still sitting in my wardrobe! With Valentine arriving, this seemed perfect and it covered the idea of getting clicked at night. Outfit– For this, we chose western wear. I wore Red Maxi from MaterialGirl and Mehul wore Black Suit. As the trend back then was of flowing veils, I really wanted one. 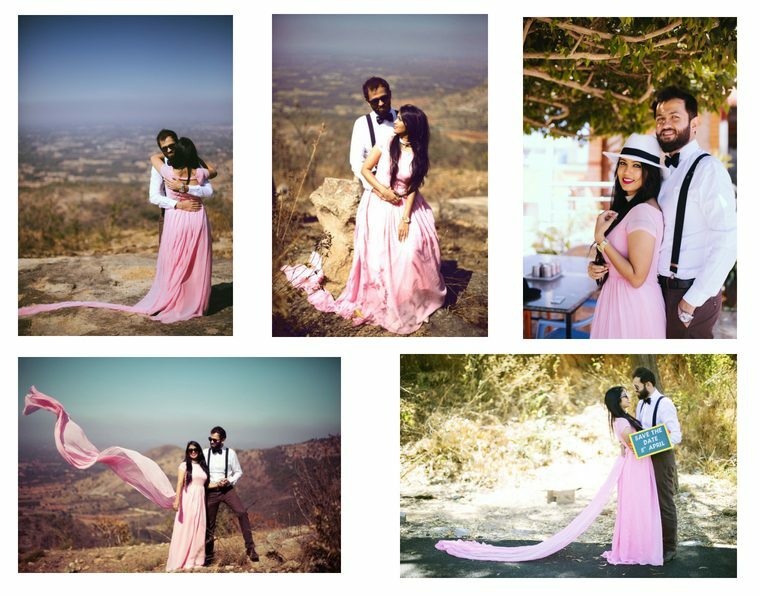 I chose a baby pink color plain maxi with an attached veil from the waist and Mehul wore a plain shirt with suspender and bow. Next use– I got the veil de-attached and I am yet to wear it as a maxi. Is your photo-shoot complete without a twirl pic? I will encourage everyone to add this to your shoot. Check which occasion is falling under your courtship and do a shoot accordingly. 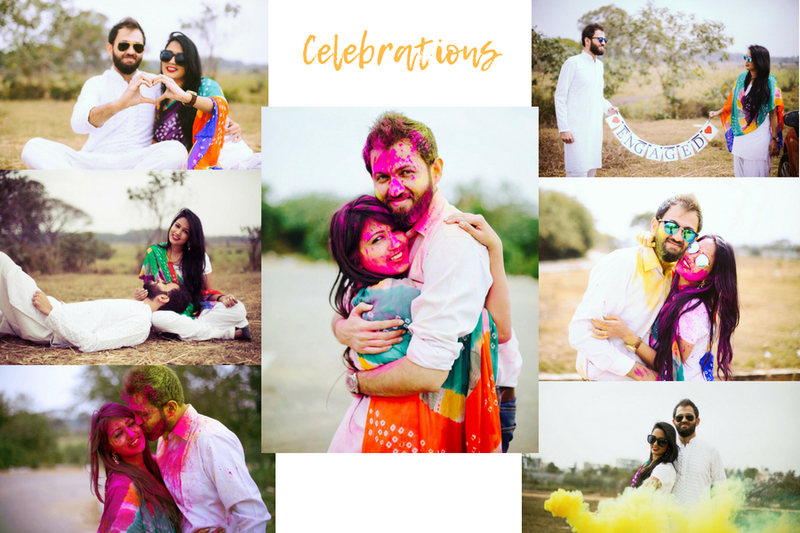 For us, Holi was the occasion so we decided for Holi theme. Outfit-I wore a plain white salwar(custom made) and a bandhej dupatta (from local market) and Mehul wore a white plain kurta pajama; white shirt. Props– We used word hangers, candle bombs and of course colors. Next use– During the shoot, the color candle bomb bursted in my hands and torn my salwar so couldn’t use it again. 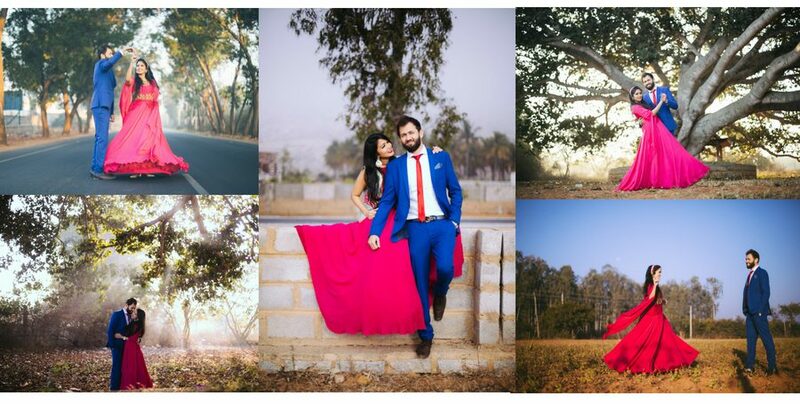 Tell us about your Pre Wedding shoot or how do you want it to be? ?